Who hasn't woken up in the middle of the night wondering what a strange noise was, or worried about faulty wiring causing a fire when they're not home? Concerns are part of life, but they shouldn't keep you from enjoying peace of mind. Southwest Security can provide you with more than just a surveillance camera. 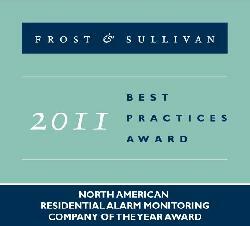 Monitoring is essential to any security system. It lets you sleep easy knowing that there is a team of trained professionals ready to act on any alert your system sends. Security monitoring is what most people think of when you bring up a monitoring service, and that is a crucial part of any security system. With our security monitoring service, your property is always connected to our fully computerized, 24 hour monitoring center that can alert emergency services in seconds. Our Alarm Response Center has maintained a Five Diamond Certification from the Central Station Alarm Association because all of our operators have been certified. These operators have to complete more than 96 hours of classroom training as well as 8 weeks of hands-on supervised experience to ensure they're prepared for any emergency you have. Being able to access your home's monitoring at any time is crucial to protecting what matters most. Everyone has their smartphone readily at hand these days; let yours be more than just a connection to social media. With a single app, you can access video monitoring, receive alerts and be kept up to date on what's happening when you're not home. With our state of the art surveillance camera installation, you can ensure that your valuables are under a watchful eye even when you have to be away from home. You tell us what you want watched and Southwest Security will help you design the security plan that will make that happen. Call us today to learn more! Call (505) 440-9025 and have our licensed security experts start designing your custom security system.